The future has arrived! The super long haul, double decker monster Airbus has arrived to the US! Direct flights to Dubai from NYC are here, and LA and SF are set for this fall and winter. Just think, in 15 – 17 hours, you can say hello to the 7-star Burj Al Arab hotel! Photographer to the stars Mona Brooks and I took a VIP flight to no where demo flight aboard the A380 — SFO to SFO, baby! Aboard, as they served us Dom Perignon champagne to toast the maiden arrival of the A380 to San Francisco, we got a two-hour tour of the behemoth. With dizzying triple jet bridges (those snout thingies for boarding–1 upstairs and 2 lower) and monster 500 – 600-ish passenger capacity depending on the model (ours was a 15-first class suite and 489 in the main cabin baby A380) the A380 will get you there fast, with style and shockingly lower emissions… providing you are flying less than 9320 miles total, its upper limit. And the A380 is QUIET… super quiet. So much so that you almost miss that white noise as you hear every word of the person behind you. Bumma. ICE: The most advanced entertainment system in the skies! Everyone gets about 1000 HD on-demand channels on their super flat screen TV’s, plus a music library of 10,000 tracks plus mood lighting–all customizable! Build your own music playlist for the journey! But biz and first get a plethora of uber goodies like 2 bar/ lounges where they can trade oil wells. Luckily first class passengers also get the use of two showers so they can rinse off after having to mix with the biz class peons. And because the new planes are made with a much lighter material than their clunky ancestors, they can spare some storage for that shower water. Yes, a SHOWER! There are two showers on board for first class passengers, who can reserve their 25-minute slots once on board. Five minutes of hot water plus a generous private cabin allow princesses to take a break from their well-appointed private suites and get away from it all. First class suites boast a minibar, bed, huge TV, vanity area and room to stretch out the Jimmy Choos-clad feet. And because they don’t want the poor princesses to have to strain to change the channel on their mega-TV, a remote control is provided to use once you’re lying down in bed. Yalla! Finally, air travel is becoming luxurious again! And with an extensive selection of connecting flights, Dubai is the new London for your more easterly journeys. Say hello to those 24-hour mega Duty Free stores! You haven’t shopped until you’ve hit the Dubai airport. All that glitters IS gold there! So, in summation, for about $10,000, roughly the same as Virgin Upper Class and a last-minute business class ticket on major airlines, you can fly first class on Emirates on an A380. Let’s go! I am so very super ultra excited. With a trip to Western Africa on the horizon next April, I am seriously considering flying Emirates to Dubai and then connecting, rather than in Heathrow. I think my paradigm has shifted! 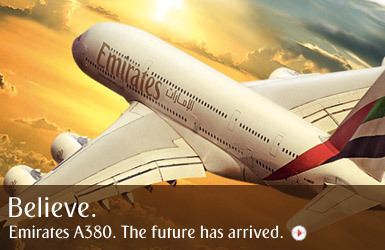 The only other airline that already has A380s in service is Singapore Airlines, the first to fly the A380 of course. If they are committed to elegance, then they fly A380s!